The Wisconsin Nutrition Education Program is a USDA federally funded grant program. FoodWIse provides educational programming on diet quality, food safety, food security, and physical fitness to low-income youth and adults in Douglas County. FoodWIse works with community partners to promote nutrition education and physical activity in Douglas County. FoodWIse participates in the Healthier Douglas County Coalition, the Family Services Advisory Board of the School District of Superior, the Douglas County Community Health Improvement Process (CHIP), Physical Activity, Adequate, Appropriate & Safe Food & Nutrition Subcommittee and the Antipoverty Coalition of Faith United Methodist Church (FUMC). A notice has been posted of a(nother) national recall of lettuce (and cauliflower) due to potential contamination from the deadly pathogen E. coli O157:H7. The Nutrition Education youth programs include lessons on MyPlate, food safety, and ways to increase physical activity. FoodWIse educators provide nutrition education & promote active lifestyles in classrooms at Cooper, Northern Lights, Lake Superior, Bryant Elementary Schools, Superior Middle School, Superior High School students in transitionand the the Family Resource Center’s Teen Parenting Program. Our Policy System and Environmental (PSE) change work in 2017-2018 is in partnership with the Superior School District as members of the district Wellness Committee developing/revising district wellness policy and creating Smarter Lunchrooms. FOODWIse partners with community agencies to provide nutrition education planning and shopping for healthy meals, managing resources on a limited income and promoting physical activity for children and adults. Superior School District’s Family Resource Center (FRC) parents enrolled in the preschool program housed in Northern Lights Elementary School, mini lessons provided to parents & families at Meet & Greet, before and after school concerts, at carnivals and within PTA’s. Northwest Community Services Agency Transitional Housing program and food pantry. Classes are held with parents of children pregnancy through preschooler at Family Forum, Inc.- Project Head Start Home Base and Center Based programs in Center #1, #2 and Brule Head Start. Parent nutrition education programs are provided throughout the year to Head Start families. Senior meal sites receive nutrition information, healthy eating, food safety and physical activity related information via our quarterly newsletters. The Food$ense newsletter is available to seniors visiting meal sites and to seniors receiving home-delivered meals. The FoodWIse Coordinator is an active member of the Sr. Connections Advisory Council. 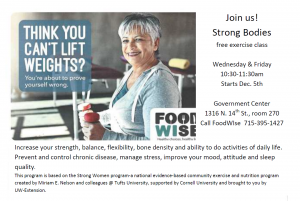 Strong Bodies Strength Training Exercise Program was developed by Tuft’s University as the Strong Bones-Strong Women program. Douglas County FoodWIse educators provide this twice weekly one hour muscle strengthening and balancing program free of charge which includes dumbbells, leg weights, exercise mat, tracking your progress and healthy eating tips! FoodWIse Douglas County Educators are certified Cooking Matters @ the Store Grocery Tour Leaders. FoodWIse Douglas County Educators provide FREE grocery tours to WIC & SNAP eligible families. Tours are provided to Douglas County residents who qualify for WIC, SNAP (Supplemental Nutrition Assistance Program also know as FoodShare in WI). Sign-up is requested. Tours are conducted by FoodWIse Nutrition Education staff. Participants take home a booklet with recipes, shopping tips, and a reusable grocery bag. When available tour participants may be offered the Shopping Challenge in which they put into practice what they’ve learned by buying food for a family of four from all five food groups. The grocery tour including the Shopping Challenge activity is approximately 1 hour and 30 minutes. Tours are available upon request. Email: Julie.Montgomery@ces.uwex.edu or call 715-395-1427 for information or to schedule a tour. New in 2017:Cooking Matters Grocery Tour Kit! FoodWIse educator Tarah Nicholds or Julie Montgomery will deliver the store to your door. Douglas County FoodWIse supports the Poverty Simulations provided to the community by UW-Extension Family Living program and UW-Superior to better understand the culture of poverty. For more information call (715) 395-1363. Douglas County formed a coalition that has worked toward access to fresh produce through NWCSA Community Gardens, Superior Housing Authority and area church sponsored gardens to increase fruit and vegetable consumption by Douglas County residents.